As a fifth generation cattle rancher, Ben Urricelqui always knew that he would return to his family’s operation to carry on their legacy of ranching and rangeland management. “Since I was young, I wanted to run cattle alongside my dad and grandfather. 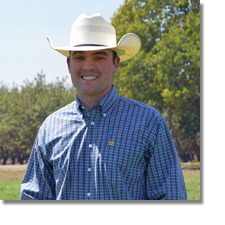 I have always admired cattle producers for their hard work and care of the land that they use.” Upon graduating in 2019, Ben hopes to contribute to his family’s operation by expanding their commercial cattle herd and continuing to improve the genetic potential of their cattle. Ben is also committed to maintaining and enhancing the rangeland that is an integral aspect of the family ranch. Ben has taken classes in rangeland management and participated in field days and student workshops to enhance his knowledge of rangeland management practices and research that can be applied directly to his family’s operation.